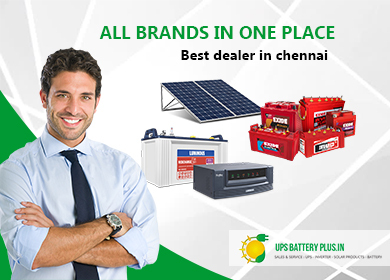 UPSBatteryPlus.in focuses on providing End to End solutions for Power backup crisis and Power Quality Enhancement through latest technologies and renewable energy sources in Chennai & Nagpur. With the increased service and manufacturing sector has resulted a congestion in the existing power resources. Addressing to this ever growing demand is the major focus area for UPSBatteryPlus.in. Over two decades of experience in Power Electronic and battery field, the founder of UPSBatteryPlus.in have vast knowledge in on-line UPS, Inverters, batteries and other Power Electronic Equipments. We have variety of power conditioning products to suit Home, Office, Education Institutions, Petrol Bunks, Hospitals, Hotel, IT, ITES and even for mission critical applications. UPSBatteryPlus is meant to offer the trending technology to their customers with extremely cost effective price. We are the combined team of experts, consultants and pioneers from renowned industrial background fused together to enrich the world with an unbelievable power solution. With our outstanding expertise and the flexible work culture drives us to be a centre of demand among in the customer’s community. As a leading online store of UPS, Car and Inverter battery, we are expanding our operation to even small cities. If you are an authorized dealer / retailer of Exide, Luminous, Amaron or SF-Sonic batteries and interested to receive and execute ready-made battery or UPS orders at your local delivery area, you are welcome to become partner with us.